I realised how MAD we must be. I mean, come on, I’m almost FIFTY TWO….what on earth am I DOING? I’m working full-time in a pretty demanding job (public sector, I’ll say no more), trying to fit in a social life and STUDYING????? I’ve studied pretty much all of my adult life. I am a serial studier. But NOW? When I should be thinking about my pension plan? 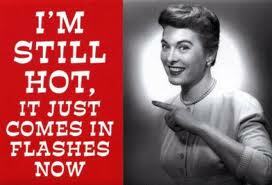 And how best to cope with the menopause???? My friend and I compared tales of how we are just not able to do ‘all-nighters’ anymore, of how we cannot understand why academics have to use such BIG words and incredibly complicated sentences to say something quite simple, of how wine is so much more appealing than reading and, simply, we questioned what on EARTH possessed us to embark on these ventures when there is absolutely NO reward at the end of it. Unless you count the graduation ceremony where you get to wear a silly hat. Yes, this is most definitely my final academic commitment. Having joined this site and realising how little I understand about computers and how to make my blog look pretty, the thought of doing a computer-related course has crossed my mind.